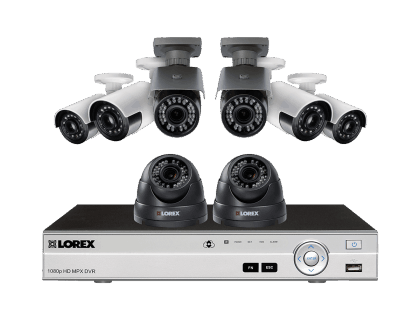 Read pricing, features, and a review for the Lorex Security System with 1080p Varifocal and Ultra Wide Angle Cameras. The Lorex Security System with 1080p Varifocal and Ultra Wide Angle Cameras is a 1080p HD security system from Lorex. It boasts varifocal dome cameras and ultra wide angles. 6 bullet and 2 dome 1080p cameras. 170 ft. maximum night vision range. Pros: Expandable hard drive and cables extend to 800 ft.
Cons: Customer reviews of their customer service have been mixed. Bottomline: A reliable security system at an excellent price. What are some alternatives to the Lorex Security System with 1080p Varifocal and Ultra Wide Angle Cameras? Where can I buy the Lorex Security System with 1080p Varifocal and Ultra Wide Angle Cameras security camera system? The Lorex Security System with 1080p Varifocal and Ultra Wide Angle Cameras is available on Amazon and on the Lorex website. Does the Lorex Security System with 1080p Varifocal and Ultra Wide Angle Cameras work at night? Yes, the camera has a maximum range of 170 ft. at night. Can the Lorex Security System with 1080p Varifocal and Ultra Wide Angle Cameras be used in any weather?